Have you ever ventured out on an unusually warm day, during an otherwise chilly winter, only to find that your long-lens images are not so sharp? It’s probably not you but what you’re looking through. As a windsurfer, I used to love to get one of those Spring days in the middle of Winter, where short sleeves and the beach were calling my name. I quickly found out that the strong winds blowing the trees were not so strong down at the water. Or rather they were, but they were extremely gusty. I could feel the warmer gusts of air hitting me. It made for frustrating sailing and it makes for poor visibility over long distances with your photography as well. 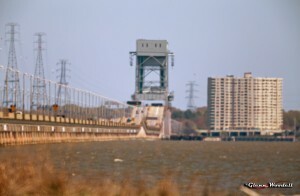 Consider this cold day image of the James River bridge taken at a focal length of 1000mm on a full frame Canon 6D. That high rise is four miles from the camera. Not bad considering it’s a prime lens with a 2X teleconverter added to it. Across the James River at 1000mm on a cold Winter’s day. Click for large image. Now consider this exact same scene, but a few days later, on an unusually warm day. 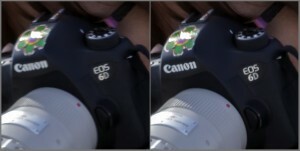 Same camera…same lens. Nothing seems to be sharp. 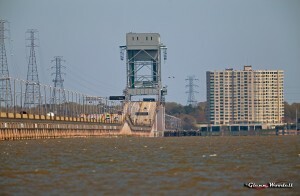 Across the James River at 1000mm on an unusually warm Winter’s day. Click for large image. As the warm air struggles to mix with the cooler, more stagnant air that it is trying to replace, it roils in like a tumble weed, bouncing across the water and the land. As a fluid, air has a particular density but it changes with its temperature. We all know that hot air rises and cold air settles. As this warm air moves in and tries to displace the cold air, you end up with a mix of different densities (temperatures) along your line of sight. You won’t have any problem over short distances, but as your viewing distance increases, you ability to get a sharp image decreases. I’ve see this affect scenes over distances as little as 100 yards. An example of turbulence over a short distance and a fraction of a second. Click for larger image. In this example, I was shooting over a distance of only about 120 feet and I held the shutter long enough in high speed burst to get two shots. Even though these were only a fraction of a second apart, the distortion due to the turbidity in the air is apparent. In the image on the left there is nothing that is truly sharp. Many of the shots that day were not usable because of the poor air quality. It was a cold day that warmed up quickly in the strong sun. Although it felt good, this heating of the ground caused sufficient mixing of substantially different air densities to make for a frustrating day. And to make matters worse, this can easily happen in warmer weather, especially if you are shooting over roads or other surfaces that collect heat from the sun. Astronomers are well aware of this phenomena and their weather reports include an entry for the visual quality. So when the warm winds blow on those unusually pretty days. Don’t be surprised if your normally-great gear seems to be not so great.